Finding the best life insurance policy can be a bit of a challenge especially after you’ve done all the research on whole life versus term life or exam versus no exam. As a life insurance agent with over 10 years of experience, I have finally found what I think in my professional opinion is one of the best life insurance plans you can buy. 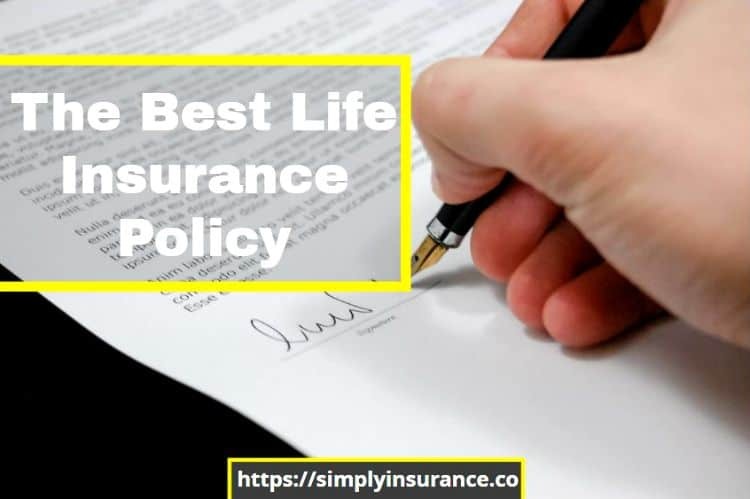 In this post today I will go over what the different life insurance policies are, how they work, and why the plan that I chose is the best, I will show you some rates and how to get the best life insurance quotes. I am sure you know this by now, but just in case you don’t let me run down the main types of life insurance. Term life insurance is going to probably be the best life insurance for about 95% of the population. When term policies are fully underwritten, it means that you will have to go through the entire process of underwriting to secure life insurance for your loved ones. This usually includes completing an exam, obtaining medical records, checking different information databases for your health history, phone interviews and sometimes financial underwriting. If the list does seem a bit long that’s because it is; however, the approval times when choosing this route are even longer. I have personally seen it take people 3 to 4 months before they were able to get an answer and it isn’t always an approval. Simplified Issue life insurance, mainly known as No Exam life insurance, is going to allow you to complete the underwriting process without an exam and at a much faster approval speed. Whole life insurance is simply life insurance that will last for your entire life. Usually, this type of policy is only best for people either looking to cover their final expenses or that are looking at it for some form of investment. This coverage is always going to be the most expensive on a month to month basis compared to any type of term life insurance policy. These policies will also build cash value. Universal life insurance comes with different options such as guaranteed universal life or variable universal life or even indexed universal life. These policies work like a middle ground between term and whole life insurance. Universal life insurance provides either permanent coverage or temporary coverage up to a certain age. When you are buying life insurance it is very important that you understand the insurance cost. Universal life products have different payment structures and you should probably reach out to an agent for more specialized assistance. You might be shocked to hear me say this, but there isn’t any type of life insurance policy that is going to be better than no exam life insurance. Since we should all be purchasing life insurance as young adults, a no exam life policy starts to turn into the best policy for almost everyone, especially us millennials that prefer to shop online anyway and want cheap life insurance. Let’s start with the obvious, no one likes needles, some people can’t even deal with the sight of blood. On top of that, trying to figure out a time that works best for you and the medical examiner can be a super hassle. The fact that this policy doesn’t have a medical exam means that you cut your waiting time for an answer by over 65%. Other than a medical exam, the second most time-consuming part of the life insurance application is process is obtaining medical records from your doctor's office. This process can sometimes take up to 1 month to get your records back to the insurance company to get an answer, this, of course, is after getting back your medical exam. Not needing medical records will cut your policy waiting time by an additional 30%. Even after a medical exam has been completed, and the medical records finally come in, sometimes the insurance company may still have questions. This means they will require a phone interview to complete processing your application request. This means going with a no exam policy option cuts your waiting time about 97% and can give you instant answers and approvals. Another thing that makes no exam the best life insurance policy is that they can be purchased 100% online. You can get instant life insurance quotes without worrying about getting called by 100 agents that are all asking you the same questions and want to sell you insurance. It might seem odd that an insurance agent would say “No Agent” is a good thing when dealing with life insurance. But most people don’t want to talk to 100 agents on the phone, and they definitely don’t want them coming to their homes anymore. If you have a pre-existing condition or particular medical case, then an agent will always be your best option, but if not, no exam is the way to go because No Agent Is Needed. There is no other type of life insurance policy that will give you an instant answer and an affordable rate. If you have been dealing with life insurance and divorce this will also be the best and fastest option for you. In the past, a no exam policy was very new, and the rates were usually 20% to 30% higher than a policy that required an exam. However, due to recent updates in technology and underwriting the rates are super close, sometimes only a buck or two more than a policy that requires an exam. I know that I would pay a little extra to avoid all of the waiting. GET NO EXAM LIFE INSURANCE COVERAGE TODAY! If this is your first time hearing about no exam term insurance or you just don’t know how it works precisely let me explain the process. You are going to start off with an application that is very simple to follow and that has some health questions. The application will start the process of underwriting you in real time while you complete the application. This is known as accelerated or real-time underwriting. While you are answering the questions on the application, the insurance company will be pulling your information from a few databases. Databases such as the Medical Information Beaureu (MIB), your Motor Vehicle Report (MVR), and you Prescription Drug Report. The application is going to use this information along with how you answer the questions to determine your eligibility instantly. No exam policies give you an immediate decision without sugar coating it, which is a good thing because it's essentially the fastest life insurance you can get. If you can’t get approved, you can find out instantly and start the process of looking for life insurance with another company or seeking help from an insurance agent. Approved - You have been approved for your plan as applied for, you can pay for your policy and be covered instantly. Declined - You have been declined for coverage and need to look elsewhere for coverage, remember that being declined from one company doesn’t mean you can’t be covered by someone else. Currently this no-exam policy doesn't come with any additional features like the return of premium, Accelerated Death Benefits or, Long term Care Insurance Rider. We have found the best life insurance company for no exam life insurance to be Bestow and we have a full review here. Bestow is the newest entrant into the life insurance world but is backed by North American Company for Life and Health Insurance. North American has been around for over 100 years and was founded in 1886, and as of today North American holds an A+ (Superior) insurer rating with A. M. Best which is a strong financial strength ratings. Bestow believes that great life insurance should be affordable, convenient, and smart. And every bit as straightforward as buying any other gift for your family. Bestow is the most affordable simplified issue, no exam life insurance product. They have a very easy online application and the process doesn't require an agent or even a checking account. We are seeing clients go from application to approval within 5 minutes; In regards to overall customer satisfaction, Bestow is the best product in this space by far. The video above shows how easy it is to look at different term lengths and coverage options in a short period of time and still get approved for life insurance while being able to pay with a credit card. Now that you know what the best life insurance​ policy is and who the best life insurance company is, it’s time to take action. From where I am standing, there shouldn’t be anything holding you back from getting a no exam life insurance policy today. Remember, it doesn’t cost you to get a quote and it doesn’t cost you to apply for coverage, you only will pay if you are approved. So, I have taken the excuse about time and the reason about not wanting to pay until you have been approved. It’s up to you now to protect your family by clicking here or any of the buttons throughout this post to get started..
GET YOUR INSTANT NO EXAM LIFE INSURANCE QUOTE!